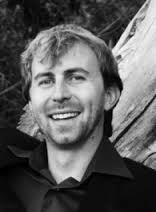 Starting out with pencil drawings that then get digitized and colored, he creates a magical comic-strip like world in which we meet ninja’s, pirates, and time-travelling monkeys. And the story moves forward quickly without missing a beat. Loads of fun! 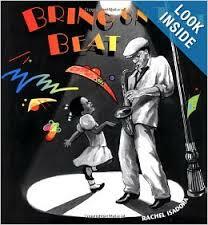 Rachel Isadora is a former ballerina turned author/illustrator who works to capture music in book form. With words that fly off the page like the best jazz lyrics and joyous, infectious illustrations of musicians at play (literally and figuratively) – she celebrates that magic and mystery of this most American of music forms. Breathtaking. The story continues as Rocket, who is now a firmly established reader, gets encouragement from his teacher to WRITE. 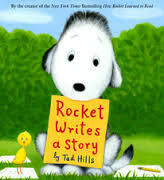 Kirkus Reviews gets it right, noting a plot that “moves along at a measured pace” and “stresses the step-by-step process of Rocket’s endeavors.” Hills illustrations, in oil and colored pencil, are touching and “lovingly depict the characters and events.” The book doesn’t just chronicle a writer’s first start, but also the special relationship between teacher and student, and the role encouragement and gentle prodding can have in getting a new writer to blossom. Heart-warming. I think Jesus must have been talking about that wonder and innocence and sincerity that children have – and challenging us to cultivate that in our adult lives. So that’s one way I do it. By heading to the library and checking out a stack of children’s picture books for my daily read. 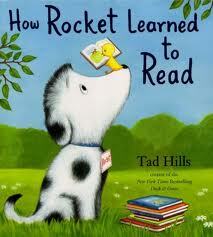 HOW ROCKET LEARNED TO READ by Tad Hills, Schwartz and Wade Books, 2010. Working in oil paint and colored pencil, Tad Hills creates the most endearing story of a dog and his slow to come interest in learning to read. Taught by a little yellow bird who is almost a dead ringer for the Looney Tunes Tweety, Rocket masters the alphabet and reading and spelling, and practices all winter long when his bird teacher has flown south with the promise to return in the Spring. The story is as much about the love of reading as it is about the caring and intimate relationship that develops between our most beloved teachers and ourselves. 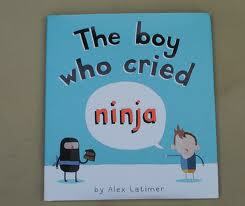 Sweet and tender, with illustrations that bring repeated smiles to the face. 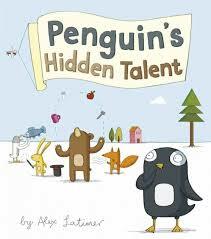 PENGUIN’S HIDDEN TALENT by Alex Latimer, Peachtree Publishers, 2012. Written by South African author and illustrator Alex Latimer and first published in Britain, this charming book explores the journey of fits and starts each of us must take experimenting until we find out what we are good at. Penguin knows what he isn’t good at: burping the alphabet, swallowing large fish, juggling appliances, and performing magic tricks. 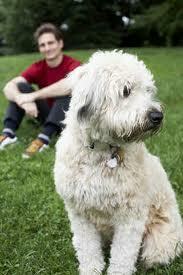 But what IS he able to do with grace and aplomb? Along the way there are fireworks, jets and special appearances by the King of Norway and the musical group the Jolly Llamas. The illustrations have a digital feel that leans toward comic book, but were originally created as pencil drawings, then digitized and finished with color and texture to make for a fresh and vibrant look. The pictures are as fun as the story itself, and both work together seamlessly. ON MY ISLAND (Sur Mon île) by Marie-Louise Gay,Groundwork Books, 2000. Originally published in French, this collage like work by French-Canadian author and illustrator Marie-Louise Gay is an exploration of state of mind, revealing that boredom is all a matter of perspective and also reinforcing the idea that no man is an island (or no man who wants to be happy should try to be). I agree with the Publishers Weekly reviewer who pointed out that the deeper meaning of the story might only be apparent to adult readers, and prove more puzzling for kids. But that’s the mark of many a great work for children, including fairy tales, Disney movies, and Looney Tunes cartoons, which all have two layers of meaning, one perceivable with maturity and sophistication, and the other just accessible and entertaining on the surface.